"Hairy Woman!" At mile 4, Dr Stephanie suggests a Trail Name for me. "Uh, thank you, I think!" is my reply. We're trekking along the Metropolitan Branch Trail, enjoying a crisp morning. Coach Fonda listens to details of last weekend's "Crazy Desert Trail Run" (verdict: Tape the Feet next time!) and shares her Maryland Heights adventure on the same day: steep hill repeats that included a stumble-fall and a badly-rolled left ankle. By mile 20 the ankle is horridly swollen. Finally, two miles later, SF agrees to catch a ride back with me. Heal, rest, recover, improve — please! "Could you take a photo of us?" I ask a passing runner, and hand her my phone. Flashback 3 years (cf. 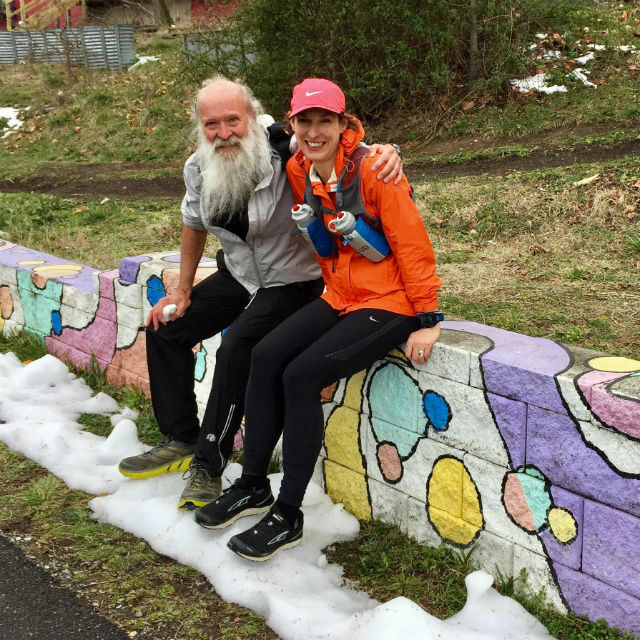 2014-02-09 - Metropolitan Branch Trail with Amy and Stephanie), when during a 20 miler Amy and Stephanie sat on this very same painted wall for me to capture their image. Small world!